This weekend, I was invited to a friend’s housewarming party. My contribution? A dessert. And at the request of the host, a chocolate dessert. Dark chocolate. I wanted the dessert to stem from a traditional French recipe – we were celebrating her moving to Paris, after all. But, at the same time, I needed it to be quick, easy to prepare (no mixer or fancy dishes), with few ingredients. Ideas immediately came to mind – but none of them fit the requirements. 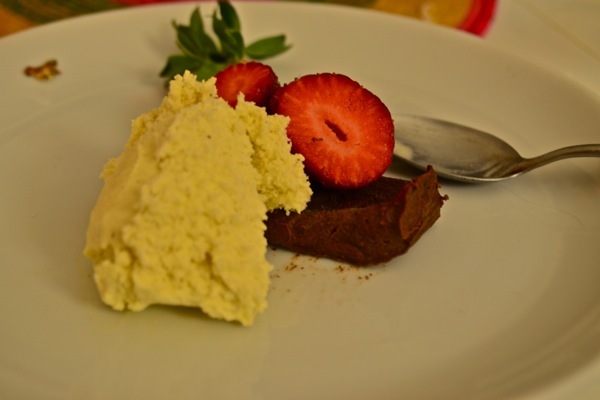 Chocolate mousse would need individual serving dishes; a soufflé would need a mixer and ramekins. I could think of many French cakes – but none chocolaty enough. That’s when I turned to David Lebovitz – trusted authority on French baking. You can always count on David: right there on his blog, a recipe for Chocolate Mousse Cake. 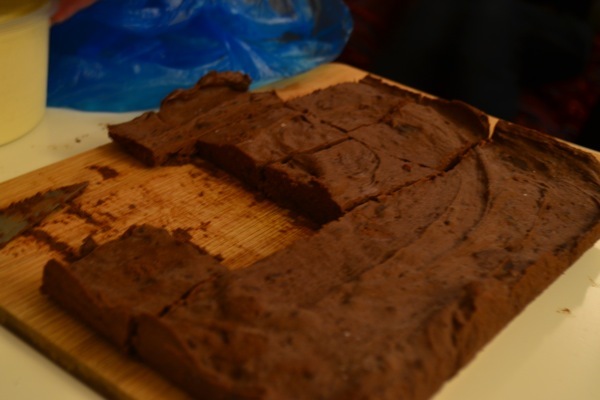 Traditionally called a “Gateau de Pape” (Pope’s Cake), it is the French version of flourless chocolate cake. It requires only five pantry ingredients: chocolate, water, butter, sugar, and eggs. The preparation, while a bit unusual, couldn’t be simpler. In fact, no baking is required at all – simply melt the chocolate and butter, whip the egg whites, and fold everything together. Then into the fridge it goes (or freezer, if you are in a time crunch). The result? A square of heaven. While we couldn’t agree weather it resembled more a mousse, fudge, or a cake, we all agreed that it couldn’t get more chocolaty. Served with vanilla ice cream and strawberries, it was the hit of the party, impressing both the Americans and French alike. Housewarming party success. In a medium saucepan on low, melt the chocolate, water, and butter. Stir continuously until the chocolate is completely smooth. This could also be done in the microwave. Remove from heat and stir in the sugar and egg yolks. Prepare an ice bath (fill your sink, or a large bowl, with a few inches of cold water and a few ice cubes). Place the saucepan of melted chocolate in the water bath, and stir until it becomes thick (think brownie batter). In a separate bowl, beat egg whites until stiff. Trust me, this can be done by hand, especially if you take turns with a friend. 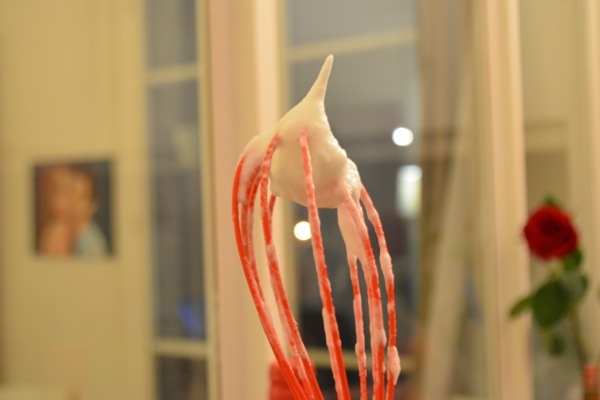 To test if you have reached stiff peaks, stick the whisk straight into the whites, and remove it straight out. The whites should hold the peak formation, and they should look a little glossy. Fold the chocolate mixture into the egg whites. Use a big wooden spoon (if you have one), and gently combine. Remember, the point is to keep as much volume in the egg whites as possible, while at the same time fully combining. Line a 9-inch pan with a moist towel (or parchment paper, if you are not willing to sacrifice a towel). Place in fridge overnight before eating (better yet – 2 days). Can’t wait? Place the pan in the freezer for at least one hour. When serving, cut the cake in small squares – it is very rich, and big slices are not necessary. Ice cream and fruit are a nice complement, but whipped cream or crème fraiche would be great as well. Or, just serve it on its own. This sounds like heaven! If I substitute coconut oil for the butter, it would be wheat and dairy free. Yay! Thanks for the recipe, and for sharing.